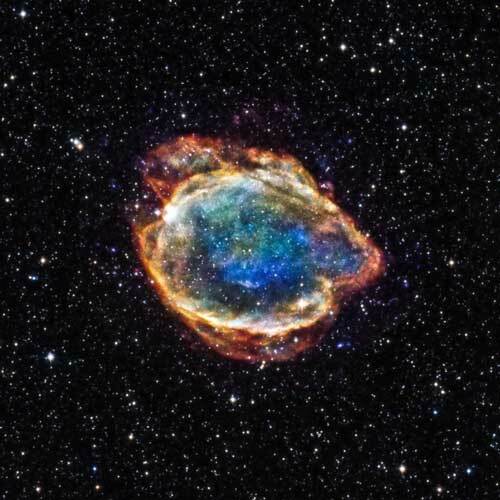 (Nanowerk News) How much light does a supernova shed on the history of universe? "The data that we examined are indeed holding up against these claims of the demise of Type Ia supernovae as a tool for measuring the universe," said Daniel Scolnic, a postdoctoral scholar at UChicago's Kavli Institute for Cosmological Physics and co-author of the new research published in Monthly Notices of the Royal Astronomical Society ("Search For Type Ia Supernova NUV-Optical Subclasses"). "We should not be persuaded by these other claims just because they got a lot of attention, though it is important to continue to question and strengthen our fundamental assumptions." One of the latest criticisms of Type Ia supernovae for measurement concluded the brightness of these supernovae seems to be in two different subclasses, which could lead to problems when trying to measure distances. In the new research led by David Cinabro, a professor at Wayne State, Scolnic, Rick Kessler, a senior researcher at the Kavli Institute, and others, they did not find evidence of two subclasses of Type Ia supernovae in data examined from the Sloan Digital Sky Survey Supernovae Search and Supernova Legacy Survey. The recent papers challenging the effectiveness of Type Ia supernovae for measurement used different data sets. Yet a substance that makes up 70 percent of the universe but remains unknown is frustrating to a number of cosmologists. The result was a reevaluation of the mathematical tools used to analyze supernovae that gained attention in 2015 by arguing that Type Ia supernovae don't even show dark energy exists in the first place. Scolnic and colleague Adam Riess, who won the 2011 Nobel Prices for the discovery of the accelerating universe, wrote an article for Scientific American Oct. 26, 2016, refuting the claims. They showed that even if the mathematical tools to analyze Type Ia supernovae are used "incorrectly," there is still a 99.7 percent chance the universe is accelerating. "The impact of this work will be to strengthen our confidence in using Type Ia supernovae as cosmological probes," he said.